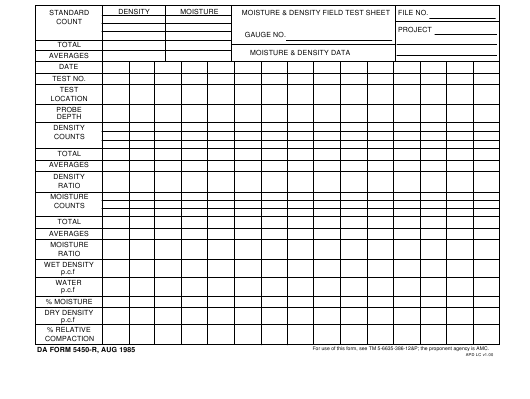 DA Form 5450-R or the "Moisture And Density Field Test Sheet" is a Department of the Army-issued form used by and within the United States Military. The form - often incorrectly referred to as the DD form 5450-R - was last revised on August 1, 1995. Download an up-to-date fillable DA Form 5450-R down below in PDF-format or look it up on the Army Publishing Directorate website. For use of this form, see TM 5-6635-386-12&P; the proponent agency is AMC. The information provided on TemplateRoller.com is for general and educational purposes only and is not a substitute for professional advice. All information is provided in good faith, however, we make no representation or warranty of any kind regarding its accuracy, validity, reliability, or completeness. Consult with the appropriate professionals before taking any legal action. TemplateRoller.com will not be liable for loss or damage of any kind incurred as a result of using the information provided on the site. Pressing the PRINT button will only print the current page. Download the document to your desktop, tablet or smartphone to be able to print it out in full. Oops! This feature is under construction and will be available soon.